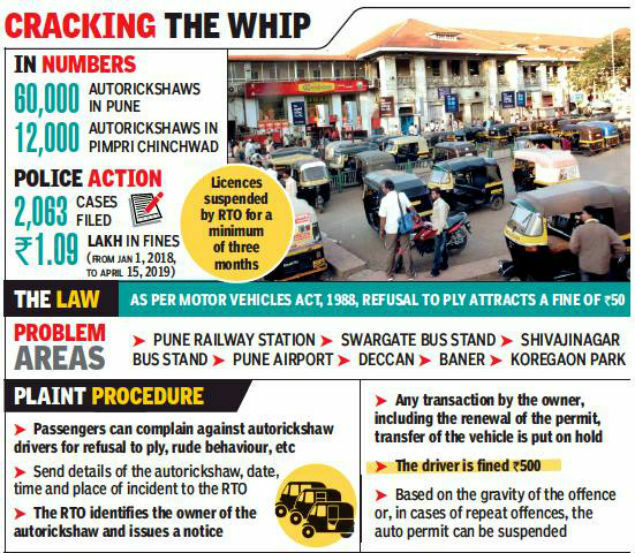 PUNE: Commuters across the city have been complaining of autorickshaw drivers refusing to ply or charge by the meter. This has prompted the local autorickshaw union to consider approaching the road transport office and urge action against violators. “Each time I want to take an autorickshaw anywhere, I have to stop 6-7 empty vehicles before I get one. It has become a nuisance. If they don’t want to ply, what do they really want to do?” Bhandarkar Road resident Yash Jalan said. Others have complained of similar experiences, be it in Baner or Kalyaninagar or NIBM Road. Many have claimed that autorickshaw drivers refuse to charge by the meter after nightfall. “After 8.30pm, they simply stop going by the meter,” Shaheen Ghasia, a professional, said. Citizens have called for strict action against errant drivers by traffic police and the RTO. “It is an offence to refuse to ply as per the Motor Vehicles Act, 1988, and the police as well as the RTO must take cognisance of the matter,” Jalan said. Shinde said the union was set to approach the RTO and urge them to initiate action against errant drivers. “We are also planning to counsel drivers,” he said. Sanjay Raut from the RTO said they take action as and when they get complaints.